Providers have reduced pension annuities with standard rates lower by 4.9% and smoker and enhanced annuity lower by 7.7% since the Brexit vote. Annuities are mainly based on the 15-year gilt yields which remain 57 basis points lower at 1.37% as investors seek safe havens following the uncertainty over the EU Referendum. Action by the Bank of England to stabilise the economy with quantitative easing injecting £250 billion and reducing interest rates if necessary has boost equity markets with the FTSE-100 index reaching a high for the year of 6,730 up 12.5% since the Brexit vote. For those that remain invested in equities, gilts and bonds, income would remain the same as the rise in the value of their fund will offset the fall in annuity rates. 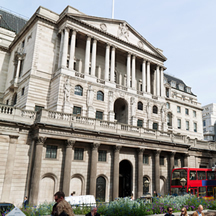 The Bank of England hinted it would reduce interest rates following the Brexit vote but in the last Monetary Policy Committee (MPC) decided to leave rates at 0.5%. Providers of enhanced annuities have now reduced rates further than the fall in the 15-year gilt yields and we could now see an increase of up to 2.0% in the short term. 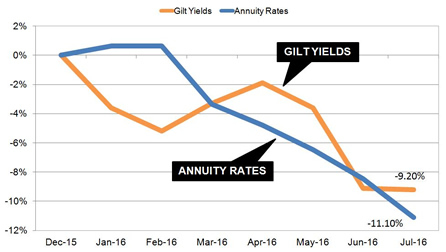 The above table shows how both yields and annuities have declined during the year with annuities lower by 11.1% and 15-year gilt yields lower by 9.2%. Since March providers have kept rates at a lower level than yields and following the EU Referendum rates have continued to decline. Since the MPC meeting and decision to hold rates, the 15-year gilt yields have increased about 10 basis points giving enhanced providers the opportunity to improve rates by about 2.0%. Standard rates offer minimal improvements and are about right when compared to yields. The above table shows our benchmark of a person aged 65 years old with a fund of £100,000 buying a lifetime annuity on a single life, level basis could purchase an income of £5,217 pa before the EU Referendum. This has reduced by £258 pa to £4,959 pa or a fall of 4.94%. For smoker and enhanced annuity rates the decrease is greater where income was £6,036 pa before the EU Referendum reducing by £467 pa to £5,569 pa or a fall of 7.73%. 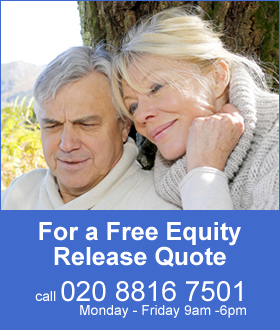 If they are invested in equities tracking the FTSE-100 index their fund would be lower by 5.6% reducing the the annuity income by £292 pa to £4,924 pa. The Bank of England may delay any decrease in interest rates until there is a clear sign the economy is in decline. Unlike the 2008 financial crisis with collapsing equity markets and the global economy entering recession, the Brexit vote is likely to result in a gradual slowdown. The MPC would be more open to taking action in August should conditions do not improve.